I bake with a scale so curiosity drove me to weigh the duck eggs. With store bought graded chicken eggs, North America large size weighs 50-55g per egg without shell. The duck eggs that I bought came in assortment of sizes. The recipe calls for two eggs and two of my duck eggs came in at 125g. With so little difference, I did not even need to adjust the flour for the recipe. The dough was tacky but still easy to handle. All I needed to do was to oil my hands before kneading on a naked silicone pastry sheet. The dough looked extra golden to me probably thanks to the larger marigold yolks. I ran out of oranges so I made the fig paste using strong brewed Earl Grey tea. The hint of bergamot was a lovely substitute. 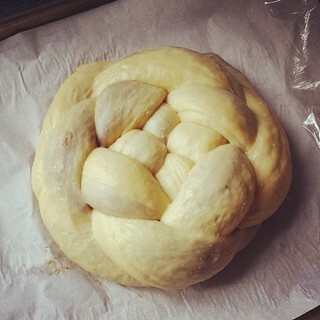 I recalled from last year that I had trouble stretching out the dough ropes. Instead of following Perelman’s direction of making two pinwheels to cut into four ropes, I made rolled out four ropes from four pinwheels instead. It worked well for me as I easily stretched each rope to about 20-inches long. 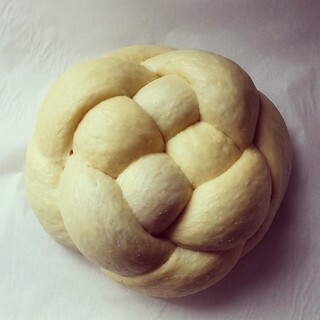 Another tip about shaping: braid the dough directly on parchment paper so you can lift the whole package onto the baking sheet! The upper left photo was my first boule which miraculously survived the messy transport from my work surface to the baking sheet. The upper right photo was my second attempt with the help of parchment paper. See how much nicer it turned out? 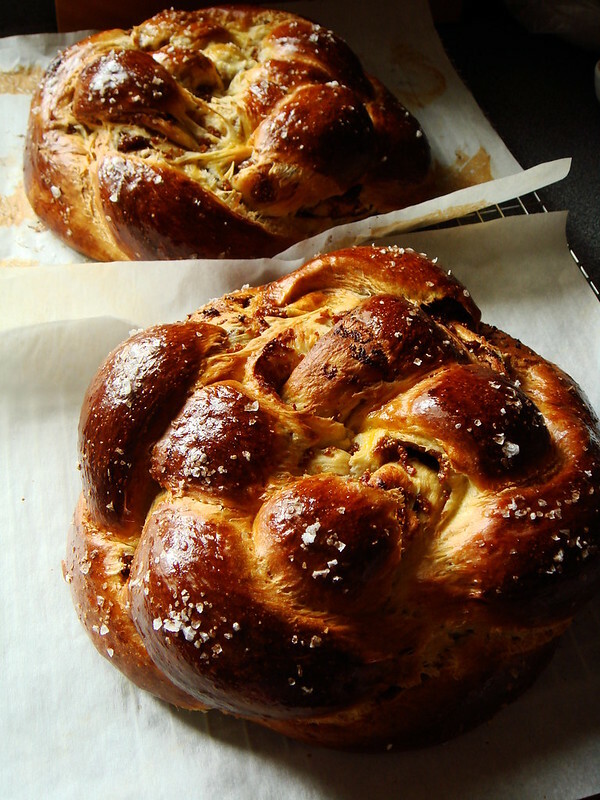 The baked challahs were beautiful. The egg wash made with yolk and water turned the crust glossy dark brown. 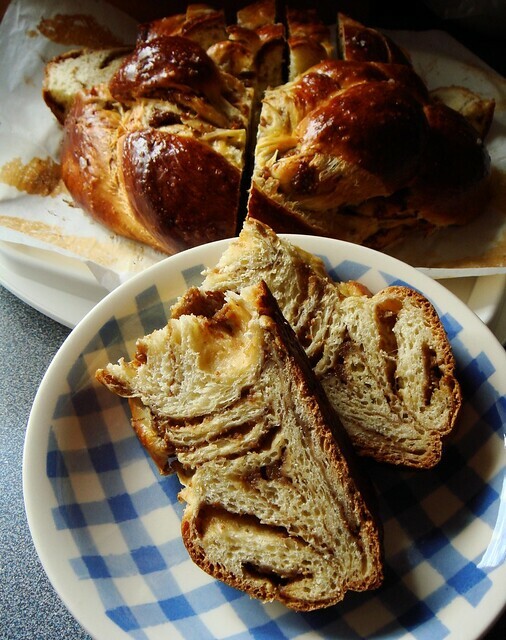 The fig filling turned jammy and swirled inside the loaf. 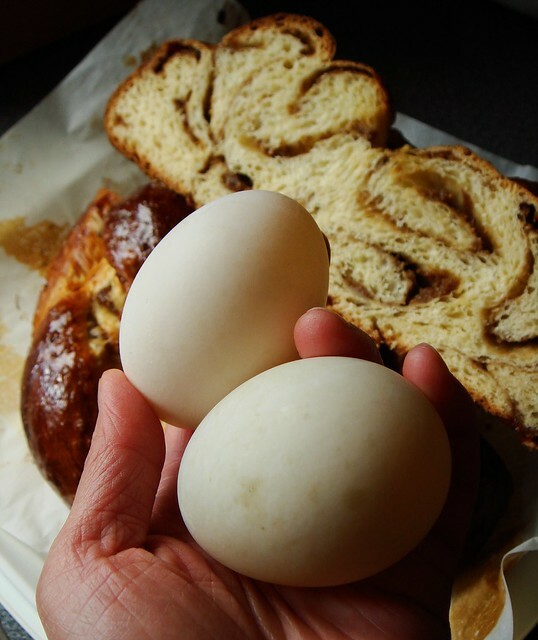 Duck eggs lend incomparable richness to the challah’s soft crumb. This bread needed no embellishment. The eggy treat already came pre-slathered with fig jam. I could not be happier with the result and already planning on using duck eggs with other yeast-leavened treat. 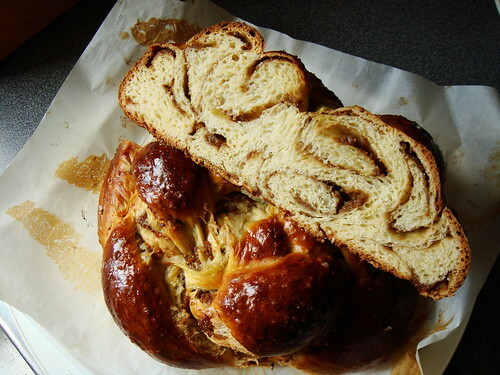 Best challah ever? Indeed it was.